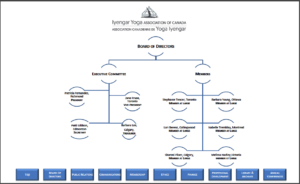 The Iyengar Yoga Associaton of Canada/Association canadienne de yoga Iyengar (IYAC/ACYI) operates through the voluntary time and effort or “karma” yoga of its members. As an incorporated non-profit organization, we have a Board of Directors elected by the membership at our Annual General Meetings. Please see below for a full listing of current IYAC/ACYI Board members and their responsibilities.